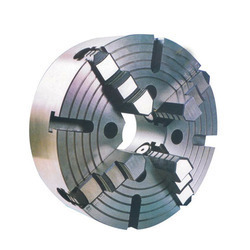 Leading Manufacturer of true chuck from Batala. True Chuck offered comes in superior forged, balanced and hardened finish so as to provide for stable working support. Suitable for universal applications, these chucks come supplied with support of internal and external stepped solid jaws as well as in four jaw choices. Here, our expertise lies in offering these chucks in different configuration finishes inkling in non-standard options as demanded by the customers. Looking for Lathe Machine Components ?